In Corfu, western Greece, arrived at 11:00 am today Ecumenical Patriarch Bartholomew, who responded to the invitation of Archbishop Nektarios of Corfu, Paxos and Diapontia Islands to visit the island as part of the celebration of its patron saint, St. Spyridon, on this coming Friday, December 12. The head of the Orthodox Church was formally received by local authorities, church representatives and numerous citizens, schools and the island’s infamous municipal philharmonic band. Upon his arrival, the Ecumenical Patriarch expressed his feelings, saying that he was very moved, and highlighted that Corfu acts as crossroads of people and civilizations, neighboring to the west with Italy and to the east with Albania. Soon after his arrival, Bartholomew visited the St. Spyridon Cathedral, where the Saint’s sacred relics are being kept. 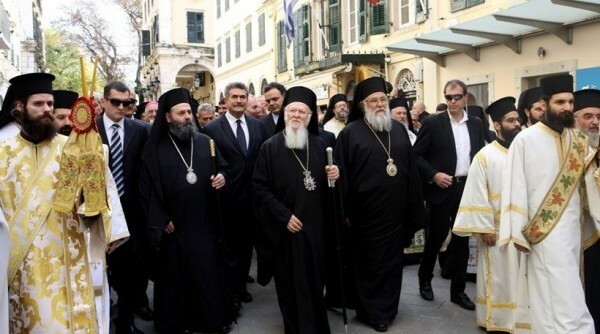 Numerous events have been scheduled during the Ecumenical Patriarch’s four-day visit to the Greek island. The last official visit of the Primate of the Orthodox Church to Corfu took place 51 years ago, in 1963, by the late Ecumenical Patriarch Athenagoras. This entry was posted in Featured News, News and tagged Aggelos Skordas, Ecumenical Patriarch, Ecumenical Patriarch Bartholomew, Greek Reporter, Patriarch Bartholomew by Orthodoxy Cognate PAGE. Bookmark the permalink.